Kansas City history buffs will recognize the names Abernathy, Jarboe, Pearle, Muehlebach, Holmes, Helmers, Agee, Volker, Benton, Sondern – prominent families building homes here. Students of architecture will know the names George Mathews, Shepard, Farrar and Wiser, Henry Hoit, Nelle Peters, Jesse Lauck, Frederick Gunns, Ernest Brostrom, and Frank Lloyd Wright – noted architects commissioned for this original work. These owners and their designers built homes in styles popular in the late 19th and early 20th centuries. They valued the wooded nature of the properties, and accommodated the buildings to the natural terrain. They blended elements from different architectural styles, combined unusual materials, and constructed buildings of such scale and quality a concentrated eclectic collection of some of the city’s most distinctive and unique homes was created. The Roanoke neighborhood began when the Roanoke Investment Company bought 188 acres from the Kansas City Interstate Fair in 1887, and filed the plat for development. The lots and winding roads are essentially the same as first platted– with one major exception -- when filed; the area was outside the jurisdiction of either independent municipality of the City of Kansas or the Town of Westport. Roanoke was one of the very first planned suburbs! Only three houses were built prior to 1900, but the annexation of Westport by Kansas City in 1897 and the subsequent availability of city services sparked a building boom. Forty homes were built between 1900-1910, representing almost half of the neighborhood. 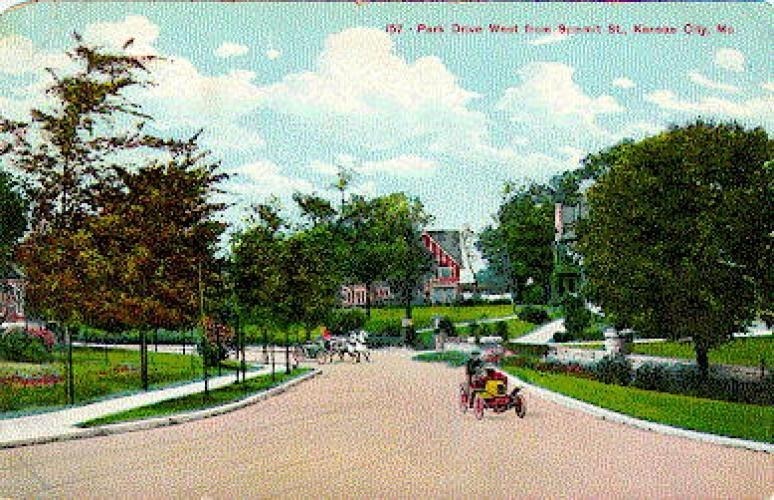 The South Highlands Land and Improvement Companyenlarged the neighborhood in the 1900s, and contributed acreage that became Roanoke Park, under the direction of George Kessler. Over the next few decades, Roanoke residents bought and contributed additional acreage to the city for park use. The Roanoke Protective Homes Association was organized in 1921. At the time, there were no city zoning codes governing the use of the properties. So, one of their first tasks was enacting and enforcing a set of regulations to guide and protect development. The “single-family residence” designation is considered key in protecting many old homes from being divided during the housing shortage of the 1940s. Today, the Roanoke Homes Association remains strong, organizing neighborhood events and representing Roanoke in efforts to protect and promote midtown and Westport communities by partnering with the neighboring neighborhoods of Valentine, Coleman Highlands and Volker. Kansas City designated Roanoke a Local Historic District in 1985, placing it under the protection of the Landmarks Commission. Any changes to building exteriors must meet standards for appropriateness, preserving the historical significance. Today as you wander the winding roads of Roanoke, you can imagine how the neighborhood looked in earlier times. Much remains unchanged. Many homes are a century old – some trees even older! Homes have been maintained, restored and renovated, and the trees maintained and replanted. The quality of the housing stock, along with initial and continued neighborhood activism, the natural beauty of the surrounding area and historic preservation protection has sustained the community. Beginning as a suburb, Roanoke now serves as a model for urban living.